Treatments for chronic musculoskeletal pain, such as lower back pain, fibromyalgia, and myofascial pain syndrome, remain inadequate because of our poor understanding of the mechanisms that underlie these conditions. Although T-type Ca2+ channels (T-channels) have been implicated in peripheral and central pain sensory pathways, their role in chronic musculoskeletal pain is still unclear. Here, we show that acid-induced chronic mechanical hyperalgesia develops in Cav3.1-deficient and wild-type but not in Cav3.2-deficient male and female mice. We also show that T-channels are required for the initiation, but not maintenance, of acid-induced chronic muscle pain. Blocking T-channels using ethosuximide prevented chronic mechanical hyperalgesia in wild-type mice when administered intraperitoneally or intracerebroventricularly, but not intramuscularly or intrathecally. Furthermore, we found an acid-induced, Cav3.2 T-channel-dependent activation of ERK (extracellular signal-regulated kinase) in the anterior nucleus of paraventricular thalamus (PVA), and prevention of the ERK activation abolished the chronic mechanical hyperalgesia. Our findings suggest that Cav3.2 T-channel-dependent activation of ERK in PVA is required for the development of acid-induced chronic mechanical hyperalgesia. Chronic musculoskeletal pain syndromes, such as lower back pain, fibromyalgia, and myofascial pain syndrome, are associated with significant disability, and current medicine is still unsatisfied because of poor understanding of the mechanism underlying the persistent pain-signaling pathway (Clauw and Crofford, 2003; Vierck, 2006; DeSantana and Sluka, 2008). Recently, an animal model of chronic muscle hyperalgesia was developed using repeated acid injections into the gastrocnemius muscle to produce a long lasting bilateral mechanical but not thermal hyperalgesia (Sluka et al., 2001). Activation of acid-sensing ion channel-3 is required for the acid-induced mechanical hyperalgesia (Price et al., 2001; Sluka et al., 2003). The development and maintenance of the hyperalgesia is associated with the changes in the CNS (Sluka et al., 2001; Skyba et al., 2002; Sluka et al., 2002; Hoeger-Bement and Sluka, 2003; Sluka et al., 2003; Tillu et al., 2008). In sensory neurons, low voltage-activated T-type Ca2+ channels (T-channels) are thought to lower the action potential threshold and promote bursting activity and synaptic excitation, which could favor the development of enhanced pain (Zamponi et al., 2009). The development of neuropathic pain is partly due to spontaneous ectopic discharge of primary afferent neurons and subsequent sensitization of dorsal horn neurons (Devor, 2009). Many pharmacological and electrophysiological studies revealed a role for T-channels in facilitating the pain sensory pathway at the peripheral nervous system and in the spinal cord (Todorovic et al., 2001, 2002; Ikeda et al., 2003; Altier and Zamponi, 2004; Jevtovic-Todorovic and Todorovic, 2006; Cheng et al., 2007; Jagodic et al., 2007). Of the three subtypes of T-channels, Cav3.1 (α1G), Cav3.2 (α1H), and Cav3.3 (α1I) (Perez-Reyes, 2006), Cav3.2 is expressed at sites essential for pain transmission in both peripheral and central nervous systems. These regions include medium- and small-sized sensory neurons of the dorsal root ganglion (DRG) and the superficial laminae of the dorsal horn, amygdala, hypothalamus, thalamus, bed nucleus of the stria terminalis, and periaqueductal gray (PAG) (Talley et al., 1999) (Allen Brain Atlas; http://www.brain-map.org). Several studies have demonstrated the importance of Cav3.2 T-channels in peripheral nociception and neuropathic pain (Bourinet et al., 2005; Todorovic and Jevtovic-Todorovic, 2006; Choi et al., 2007). Cav3.2−/− mice also showed attenuated pain response to all acute behavioral models of pain (Choi et al., 2007). Given the pronociceptive role of Cav3.2 T-channels in different pain models, Cav3.2 T-channel could be a potential therapeutic target for treatment of chronic muscle pain syndromes, such as chronic widespread pain and fibromyalgia. Therefore, we hypothesized that Cav3.2 T-channels play an important role in the development of mechanical hyperalgesia induced by repeated intramuscular acid injection. All research performed conformed to National Institutes of Health guidelines in accordance with the guidelines specified by the Institutional Animal Care and Utilization Committee, Academia Sinica (Taipei, Taiwan). Cav3.1−/− and Cav3.2−/− mice were generated as described previously (Kim et al., 2001; Chen et al., 2003). Cav3.1−/− mice have been bred to C57BL/6 background for >10 generations, and Cav3.2−/− mice have been bred to C57BL/6 background for 6 generations. Congenic Cav3.2−/− mice on 129SVE/J background were also used as mentioned in the study. Genotypes of these mice were determined by PCR. Both male and female mice at 9–12 weeks of age were used. All mice were housed in specific pathogen-free conditions in the Institute of Biomedical Sciences, Academia Sinica. Acid injection and behavioral testing. All mice were briefly anesthetized with vaporized isoflurane (1.5%) and received injections of 20 μl of acidic (pH 4.0) or neutral (pH 7.2) saline on days 0 and 5 in the left gastrocnemius muscle as described previously (Sluka et al., 2001). The measurement of the withdrawal response to mechanical stimuli of experimental mice was applied using von Frey filament (North Coast Medical). Mice were placed in clear plastic, wire mesh-bottomed cubicles and allowed to acclimate for 20–30 min. Von Frey filaments of varying bending forces (0.16, 0.4, 1, 1.4, 2, and 4 g) were applied in a progressively increasing manner until the hindpaws were withdrawn. Following this protocol, 1 g of bending force of von Frey monofilament was chosen for the mechanical hyperalgesia experiment. Responses to a monofilament were recorded for each mouse, and the percentage response for each foot was obtained by the number of withdrawal responses of the applications to each foot. The von Frey monofilament test was measured on days 0, 1, 2, 5, 6, and 8. The bilateral behavioral test was measured twice, both before and 4 h after acid injection on day 0 and day 5. Averaged withdrawal ratios from bilateral behavioral tests are shown in Figures 2⇓⇓–5. Experiments shown in Figure 5 were done in a blinded manner; experiments shown in other figures were repeated by a different researcher. Fluorogold labeling, isolation of DRG neurons, and electrophysiology. The muscle afferent neurons were retrograde-labeled with Fluorogold (4% in 10 μl of saline), which was injected into gastrocnemius muscle for 6–8 d before DRG isolation. Lumbar parts of DRG (L1–L5) were dissected out and incubated at 37°C for 90 min in DMEM containing 1 mg/ml collagenase (type 2; Sigma) and then at 37°C for 10 min in 0.25% trypsin. Cell bodies were obtained by trituration in DMEM through fired-polished Pasteur pipette. Cells were plated into 35 mm Petri dish containing DMEM and then cultured at 37°C in a 95% air and 5% CO2 atmosphere. All cells were used within 24 h after plating. Fluorogold-labeled muscle afferent neurons can be identified under UV and subject to whole-cell patch clamp recording. Whole-cell patch clamp recordings were performed at room temperature (20–24°C) using an Axopatch 700B amplifier (Molecular Devices) as described previously (Chiang et al., 2009). The external solution used for voltage-clamp recordings contained the following (in mm): 145 tetraethylammonium (TEA)-Cl, 1 MgCl2, 5 glucose, 10 HEPES, 5 CsCl, and 2 CaCl2, adjusted to pH 7.25 with TEA-OH. The internal solution contained the following (in mm): 130 CsCl, 5 MgCl2, 10 EGTA, 20 HEPES, 3 Mg-ATP, and 0.3 Tris-GTP, adjusted to pH 7.25 with CsOH. The average cell capacitances were 40.2 ± 2.3 (n = 11) and 45.7 ± 2.2 pF (n = 8) in pH 7.2- and pH 4.0-treated groups, respectively. Ethosuximide (ETX), phorbol 12,13-dibutyrate (PDBU), and nicardipine were purchased from Sigma. U0126 and NNC 55-0396 were purchased from Tocris. ETX and NNC 55-0396 were dissolved in saline, nicardipine was dissolved in 2.5% ethanol, and 3 mm PDBU and 10 mm U0126 were dissolved in 100% DMSO as stocks. Before application to animals, PDBU and U0126 were diluted 1:1 in saline to a concentration of 1.5 and 5 mm, respectively. Fifty percent DMSO was used for further dilution and as a vehicle control. Intraperitoneal injection of 100 to 150 μl of drug or saline was performed 15 min before the second acid injection on day 5. The dosages of ETX used were 10, 30, 60, 100, 200, 300, and 600 mg/kg. Nicardipine dosages were 10, 30, and 75 mg/kg. Intramuscular injection (10 μl) of ETX (0.1 and 0.2 mg), NNC 55-0396 (1 μg) or saline was performed 1 min before second acid injection. Intrathecal (i.t.) injection (5 μl) of ETX (0.1 and 0.2 mg), NNC 55-0396 (1 μg), or saline (1:1 mixed with 4% trypan blue dye) was performed 1 min before second acid injection. Intrathecal administrations was performed according to Hylden and Wilcox (1980) via direct transcutaneous injection using a 30 gauge needle between the L5 and L6 dorsal spinal process while the animal were anesthetized with isoflurane (1.5%). The presence of trypan blue dye in the mouse spinal cord was examined at the end of experiment (day 8). Only the trypan blue-positive animals were counted for behavioral testing analysis. Intracerebroventricular injection (5 μl) of ETX (0.2 mg), NNC 55-0396 (1 μg), nicardipine (125 μg), or saline was performed 1 min before second acid injection. Intra-anterior paraventricular thalamic nucleus (PVA) injection (0.3 μl) of PDBU (20 pmol), U0126 (1.5 nmol), or vehicle was performed before the second acid injection. Cannulation was performed according to the procedure modified by Lambert (Lambert et al., 1995). In brief, the mice were anesthetized with ketamine (0.85 mg/kg) and xylazine (0.15 mg/kg). The head was fixed in a stereotaxic frame, and a single guide cannula was implanted just above target site. The stereotaxic coordinates and cannula sets are as follows: (1) intracerebroventricular, 0.44 mm anteroposterior and 3 mm dorsoventral from bregma, 23 gauge, 9.5 mm stainless steal cannula, 30 gauge 10 mm infusion cannula; (2) intra-PVA, 0 mm anteroposterior and 3.9 mm dorsoventral from bregma, 26 gauge 9.5 mm stainless steel cannula, 33 gauge 10 mm infusion cannula. Cannulae were fixed in place by dental cement applied around them onto the skull. A stainless steel, flush-fitting stylet was inserted into the cannula. Before infusion, the stylet was removed and an injection cannula was inserted. This cannula was connected to a Hamilton syringe via a section of tubing more than 50 cm in length (PE10, Portex). Inside the syringe and the tubing were the distilled saline, an air bubble (5 μl), and the infusion solution at the distal end. The air bubble separates the saline and the infusion drug and acts as an index of the success of the drug infusion as well. For intra-PVA injection, the cannulation was performed on the second day after the first acid injection. On day 5, 0.3 μl of the drug was infused over a period of 3 min using a syringe pump (KD Scientific), and the injection cannulae were kept in place for an additional 2 min to allow the drug to diffuse. Second acid or pH 7.2 saline was then applied. At the end of the experiment, brains were sectioned and stained to verify the injection site. Ten minutes after the second acid saline injection into left gastrocnemius muscle, mice were deeply anesthetized and then perfused transcardially with PBS, followed by 10% neutral buffered formalin solution. The brain and spinal cord were dissected and fixed and embedded in paraffin blocks. Five micrometer sections were cut and mounted on the slide. Sections were immersed in the staining dish containing DakoCytomation Target Retrieval Solution at 96°C for 1 h. Sections were washed and blocked with 3% H2O2 and then serum blocking solution (2% normal goat serum in PBS plus 0.05% Tween 20) at room temperature. Sections were then incubated with pERK (phosphorylated extracellular signal-regulated kinase) antibody (1:200, in serum blocking solution, Cell Signaling Technology) or c-Fos antibody (1:800, in serum blocking solution, Santa Cruz Biotechnology) at 4°C overnight. After washing with PBS, anti-rabbit antibody conjugated with horseradish peroxidase (1:500, in serum blocking solution, Pierce Biotechnology) was used to detect primary antibody. Detection was performed using a DAB Enhanced Liquid Substrate System (Sigma-Aldrich). In all tests, paw withdrawal ratios were compared using ANOVA, followed by Holm–Sidak post hoc analysis. Comparisons between two means were performed by Student's t test. A value of p < 0.05 was considered significant. Data were presented as mean ± SEM. To evaluate whether intramuscular acid injections results in different mechanical nociceptive responses in wild-type (WT) and T-channel deficient mice, we injected acidic saline twice into the left gastrocnemius muscle 5 d apart. Mice were then examined for their hindlimb withdrawal responses using 1 g of von Frey monofilament (Fig. 1). 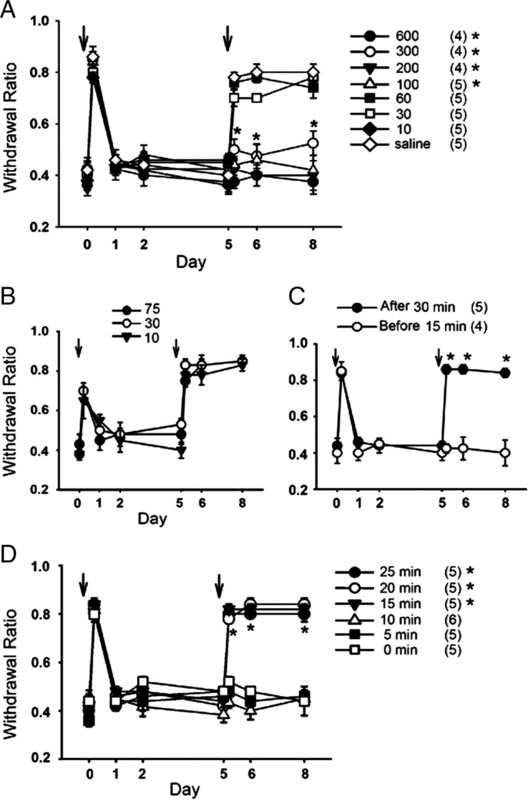 Similar to previous reports (Sluka et al., 2003; Gandhi et al., 2004), there was a transient increase in the mechanical nociceptive responses at 4 h after the first acid injection, and the response returned to baseline after 24 h. On day 5, a second acid injection induced a similar persistent bilateral mechanical hyperalgesia in WT and Cav3.1−/− mice. The withdrawal ratio of ipsilateral side at 4 h after second acid injection was 76 ± 2% (n = 7) and 82 ± 3.7% (n = 5) in WT (Fig. 1A) and Cav3.1−/− mice (Fig. 1B), respectively. In comparison, Cav3.2−/− mice failed to develop the persistent mechanical hyperalgesia after the second acid injection (Fig. 1C). The withdrawal ratio of the ipsilateral side at 4 h after the second acid injection was 43 ± 3% (n = 8) in Cav3.2−/− mice (p < 0.05 compared to that in WT mice). Interestingly, the initial increase in the mechanical hyperalgesia at 4 h after the first acid injection was normal in Cav3.2−/− mice. These data suggest that Cav3.2 but not Cav3.1 T-type Ca2+ channel is involved in the development of persistent mechanical hyperalgesia induced by repeated acid injections. Acid-induced chronic mechanical hyperalgesia develops in WT and Cav3.1−/− but not Cav3.2−/− mice. A–C, Mechanical responses of WT (A, n = 7), Cav3.1−/− (B, n = 5) and Cav3.2−/− mice (C, n = 8) following the injection of acid into the gastrocnemius muscle. In all panels, arrows indicate days on which mice received acid injections. Filled circles represented ipsilateral side, and open-circles represented contralateral side. Error bars represent SEM. To assess whether the reduced mechanical hyperalgesia resulted from developmental changes in the Cav3.2−/− mice or rather the absence of Cav3.2 T-type Ca2+ channels, we applied the T-channel blocker ETX intraperitoneally to WT animals 15 min before the second acid injection. ETX effectively prevented the development of mechanical hyperalgesia before the second acid injection in a dose-dependent manner (Fig. 2A). Our results showed that the minimal dosage required to prevent the development of mechanical hyperalgesia for ETX is 100 mg/kg. ETX also prevented chronic mechanical hyperalgesia in Cav3.1−/− mice, providing further support for the idea that Cav3.1 T-channels are not involved in acid-induced chronic mechanical hyperalgesia. We also tested the effect of the L-channel blocker nicardipine on the acid-induced mechanical hyperalgesia in WT mice. As shown in Figure 2B, systematic application of three different concentrations of nicardipine before the second acid injection had no effect on the persistent mechanical hyperalgesia in WT mice. Blocking T-channels prevents the development of acid-induced chronic mechanical hyperalgesia in WT mice in a dose- and time-dependent manner. A, Effects of different dosages (in mg/kg) of ETX administered intraperitoneally. One hundred milligrams per kilogram is the lowest dosage tested that prevented hyperalgesia. *p < 0.05, compared with saline-treated animal. B, Effects of different dosages of the L-channel blocker nicardipine. None of the dosages tested had a significant effect on acid-induced hyperalgesia (n = 4). C, Effects of ETX injection before and after the second acid injection. Treatment with ETX 15 min before but not 30 min after the second acid injection prevented acid-induced chronic hyperalgesia. *p < 0.05, compared with group treated with ETX 15 min before acid injection. D, Effects of ETX administration at different time points (0, 5, 10, 15, 20, and 25 min) after the second acid injection. ETX given at 10 min (or less) after second acid injection prevented the development of mechanical hyperalgesia. In contrast, ETX given at 15 min (or more) after second acid injection had no effect on the development of mechanical hyperalgesia. Numbers in parentheses indicate the number of animals tested. *p < 0.05, compared with 0 min group. Error bars represent SEM. Since acid-induced chronic mechanical hyperalgesia was blunted in Cav3.2−/− mice and by ETX in WT mice, these data suggest that T-channels, most likely Cav3.2, are required in this process. We reasoned that persistent availability of the Cav3.2 T-channels may be necessary for the maintenance of hyperalgesia. Surprisingly, intraperitoneal injection of ETX 30 min after the second acid injection had no effect on the mechanical hyperalgesia (Fig. 2C). To test whether T-channels are instead required for the initiation of mechanical hyperalgesia, we applied ETX either immediately or 5, 10, 15, 20, or 25 min after the second acid injection. We found that ETX injected at 15 min or later after the second acid injection did not prevent the development of mechanical hyperalgesia (Fig. 2D). In contrast, when administered immediately or 5 or 10 min after the second acid injection, ETX effectively prevented chronic mechanical hyperalgesia. These results suggest that T-channels are required to initiate, but not to maintain, acid-induced chronic mechanical hyperalgesia. Because ETX can cross the blood-brain barrier (Patel et al., 1975), it could potentially target T-channels of both the peripheral and central nervous systems. To determine where the Cav3.2 T-channels are involved in the development of mechanical hyperalgesia, we applied ETX intramuscularly, intrathecally, or intracerebroventricularly immediately before the second acid injection in WT mice. In addition to ETX, we also tested a more selective T-channel blocker, NNC 55-0396. NNC 55-0396 is a derivative of mibefradil that does not block L-type Ca2+ channels and thus is a more selective T-channel inhibitor (Huang et al., 2004). We found that intramuscular injection of ETX or NNC 55-0396 failed to prevent mechanical hyperalgesia (Fig. 3A). These results suggest that peripheral Cav3.2 T-type Ca2+ channels are not involved in signaling process induced by acidic saline injection. Recently, it has been shown that a twofold increase of DRG T-channel current density is observed in a rat model of diabetes-related neuropathic pain (Jagodic et al., 2007). We also recorded T-currents from isolated Fluorogold-positive muscle afferent DRG neurons following acid or saline injections. Although mechanical hyperalgesia was apparent 24 h following the second acid injection, there was no significant difference in the density of DRG T-currents between the acid- and saline-treated groups (Fig. 3B). These results suggest that neither peripheral nor DRG Cav3.2 T-channels are involved in the signaling process induced by acid. Peripheral and spinal T-channels are not involved in the development of acid-induced chronic hyperalgesia. A, Intramuscular injection of ETX (0.1 and 0.2 mg) or NNC 55-0396 (NNC, 1 μg) did not prevent acid-induced chronic hyperalgesia. B, Current–voltage curves of T-currents recorded from Fluorogold-labeled muscle afferents DRG neurons. Numbers in parentheses indicate the number of cells recorded. Inset shows representative current traces evoked by a depolarizing step to −40 mV from a holding potential of −90 mV. C, Intrathecal injection of ETX (0.1 and 0.2 mg) or NNC (1 μg) did not prevent acid-induced chronic hyperalgesia. D, The induction of spinal c-Fos expression in response to repeated acid injection was similar in WT and Cav3.2−/− mice. E, The number of c-Fos-positive cells in the dorsal horn in WT and Cav3.2−/− mice that received pH 4.0 or pH 7.2 saline. Averaged numbers of c-Fos-positive cells from three consecutive sections were counted per animal. Three animals were used for each treatment. *p < 0.05, compared with group treated with pH 7.2 saline. Error bars represent SEM. It has been shown that acid-induced mechanical hyperalgesia leads to increased bilateral spread of the receptive field (Sluka et al., 2003), phosphorylation of CREB (cAMP response element-binding protein) (Hoeger-Bement and Sluka, 2003), and c-Fos expression (Gandhi et al., 2004) in spinal neurons. Thus, to determine whether spinal Cav3.2 T-channels are involved, we injected ETX, NNC 55-0396, or saline intrathecally and found this had no effect on mechanical hyperalgesia (Fig. 3C). Similarly, there was no significant difference in the acid-induced c-Fos expression between acid-injected WT and Cav3.2−/− spinal cords (dorsal horn) (Fig. 3D, E). These data suggest that acid-induced signal transduction from peripheral nerve termini to the spinal cord does not depend on the Cav3.2 T-channels. Finally, we examined whether T-channels in the brain are required for the chronic phase of acid-induced hyperalgesia. Intracerebroventricular injection of NNC 55-0396 or ETX (the same dosage used in intramuscular and intrathecal injections) effectively prevented the development of mechanical hyperalgesia induced by repeated acid injections (Fig. 4A), whereas intracerebroventricular injection of nicardipine or saline had no effect (Fig. 4A). Overall, these results suggest that Cav3.2 T-type Ca2+ channels in the brain, but not those in the spinal cord or DRG, are involved in acid-induced chronic mechanical hyperalgesia. T-channels in the brain are required for the development of acid-induced chronic muscle hyperalgesia. A, Intracerebroventricular injection of ETX (0.2 mg) or NNC 55-0396 (NNC, 1 μg), but not nicardipine (0.125 mg), prevented acid-induced chronic mechanical hyperalgesia in WT mice. *p < 0.05, compared with saline-treated animals. B, C, pERK staining in the central nucleus of the amygdala (Amyg) (B) and the piriform cortex (Pir) and paraventricular hypothalamic nucleus (PVN) (C) following acid injection was similar in WT and Cav3.2−/− mice at 10 min after second acid injection. D, Acid-induced, Cav3.2 T-channel-dependent pERK staining was observed in the PVA (outlined by dashed line). 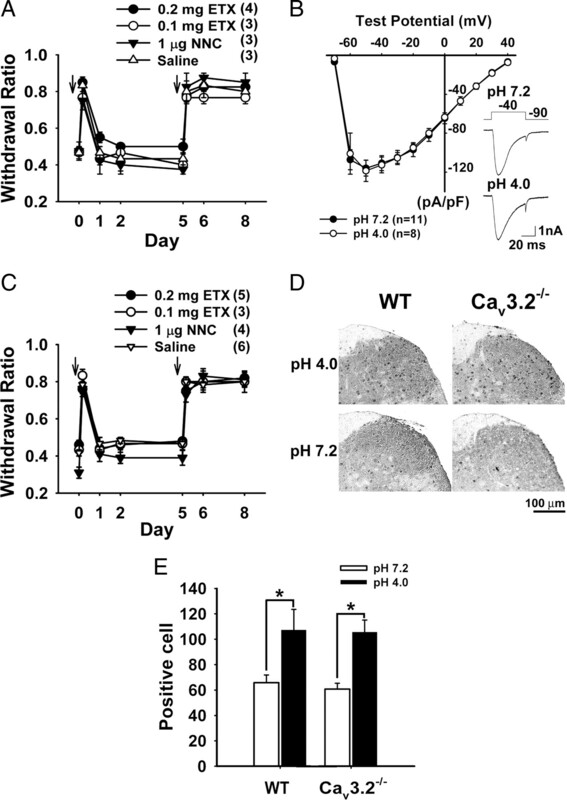 pERK staining in the PVA was observed in pH 4.0 saline-injected WT but not Cav3.2−/− mice. E, Quantification of pERK-positive cells in the PVA from WT and Cav3.2−/− mice that received pH 4.0 or pH 7.2 saline. Average numbers of pERK-positive cells from three consecutive sections were counted per animal. Three animals were used for each treatment. *p < 0.05, compared with WT group. Error bars represent SEM. We then set out to corroborate this theory by testing whether any acid-induced, T-channel-dependent neuronal activities can be measured in brain. To address this, we performed immunohistochemical staining for the phosphorylation of ERK following acid injection. Neuronal ERK can be phosphorylated and activated following exposure to various stimuli, including neuropathic pain (Obata and Noguchi, 2004; Giovannini, 2006). Indeed, we observed an acid-induced increase of pERK staining 10 min after the second acid injection in several regions of brain, including the central nucleus of the amygdala (CeA), piriform cortex, and paraventricular hypothalamic nucleus (Fig. 4B,C). Interestingly, acid-induced pERK staining in these regions was similar in WT and Cav3.2−/− mice. These results suggest that the activation of pERK-positive neurons in these regions is acid dependent but not Cav3.2 dependent. However, we did observe an acid-induced increase in pERK staining in the anterior paraventricular thalamic nucleus in WT but not Cav3.2−/− mice (Fig. 4D,E), which suggests that the acid-induced, Cav3.2-dependent activation of ERK in the PVA may be important in the development of acid-induced chronic hyperalgesia. To test whether blockage of ERK activation in the PVA has an effect on the acid-induced chronic hyperalgesia, we locally infused the MEK (mitogen-activated kinase/ERK kinase) inhibitor U0126 (1.5 nmol) in PVA immediately before the second acid injection in WT mice. We first examined the effect of U0126 on inhibition of ERK activation. Indeed, immunostaining of brain section revealed a clear inhibition of acid-induced ERK activation in PVA compared with the vehicle-infused ones (Fig. 5A). Interestingly, PVA infusion of U0126 did not affect the acid-induced activation of ERK in amygdala (Fig. 5A). These data suggest that the pain signaling might reach amygdala first before projecting to PVA. Behavioral studies showed that PVA infusion of U0126 in WT mice prevented the acid-induced chronic mechanical hyperalgesia, while the vehicle control has no effect (Fig. 5B). These results suggest that activation of ERK in PVA is required for the acid-induced chronic mechanical hyperalgesia. T-channels in the brain are required for the development of acid-induced chronic muscle hyperalgesia. A, pERK staining in the PVA following acid injection was observed in vehicle but not U0126 intra-PVA infusion in WT mice. Amygdala pERK staining was similar in both vehicle and U0126 infusion groups. B, Intra-PVA infusion of U0126 (1.5 nmol) but not vehicle before the second acid injection into muscle prevented acid-induced chronic muscle hyperalgesia in WT mice. C, pERK staining in the PVA following acid injection was observed in PDBU but not vehicle intra-PVA infusion in Cav3.2−/− mice. Amygdala pERK staining was similar in both vehicle and PDBU infusion groups. D. Intra-PVA infusion of PDBU (20 pmol) but not vehicle before second acid injection into muscle enabled acid-induced chronic muscle hyperalgesia in Cav3.2−/− mice. *p < 0.05, compared with vehicle-treated group. Error bars represent SEM. We then tested whether pharmacological activation of ERK in Cav3.2−/− PVA could change the acid-induced behavior. To mimic the activation of ERK in PVA, we infused PDBU (20 pmol) into PVA before the second acid injection in Cav3.2−/− mice. Immunostaining of a brain section revealed that infusion of PDBU lead to the activation of ERK in the PVA region in Cav3.2−/− mice (Fig. 5C). The acid-induced activation of ERK in amygdala was similar in vehicle and PDBU-infused groups in Cav3.2−/− mice (Fig. 5C). 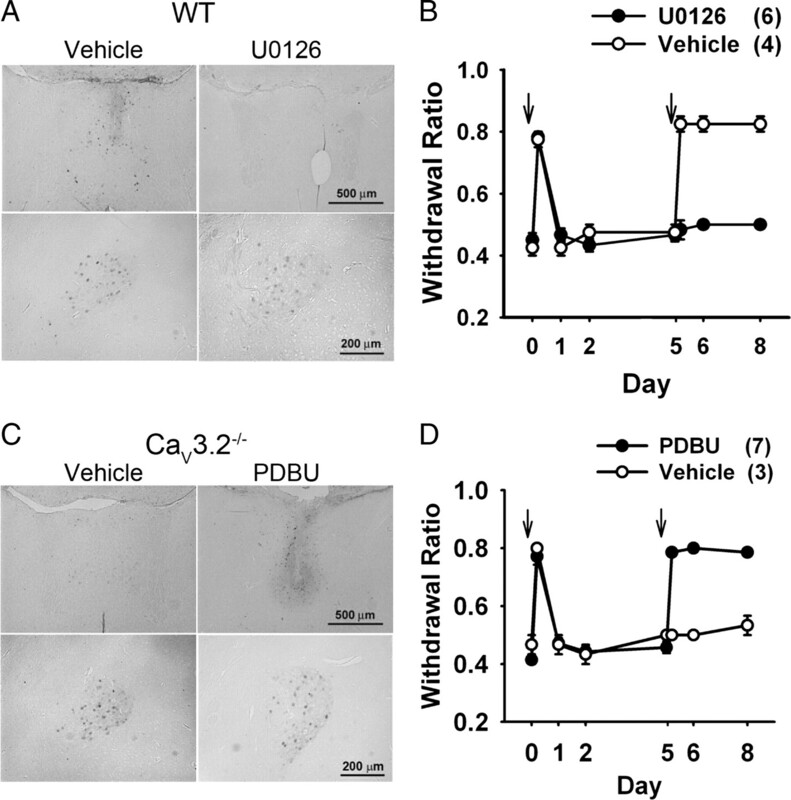 Behavioral analysis showed that PVA infusion of PDBU before the second acid injection enabled the acid-induced chronic hyperalgesia in Cav3.2−/− mice (Fig. 5D). These results further support the idea that activation of ERK in PVA is required for acid-induced chronic hyperalgesia. It also suggests that activation of ERK is likely downstream of Cav3.2 T-channel activation in PVA. In this study we demonstrated that chronic hyperalgesia induced by repeated intramuscular acidic saline injections was abolished in mice lacking Cav3.2 T-channels. The requirement of T-channels in this pain model is unique to Cav3.2, because Cav3.1-deficient mice still developed chronic hyperalgesia induced by acid. By applying T-channel blockers at different locations, we also demonstrated that brain Cav3.2 T-channels, but not those in spinal cord or peripheral nerves, are involved in the development of chronic hyperalgesia. Neuronal activity represented by the staining of pERK was observed in several brain regions in both WT and Cav3.2−/− mice that received repeated acid injections, but not in PVA of Cav3.2−/− mice. We further demonstrated that activation of ERK in PVA is required for acid-induced chronic hyperalgesia. Taken together, these data strongly support the idea that Cav3.2 T-channel-dependent activation of ERK in PVA is required for the development of acid-induced chronic hyperalgesia. It has been shown that Cav3.2−/− mice displayed reduced responses to acute thermal and mechanical stimuli and decreased inflammation-induced pain (Choi et al., 2007). However, in this study, we did not observe any difference in the baseline of mechanical nociceptive response between the WT and Cav3.2−/− mice. The discrepancy could be caused by different mouse strain backgrounds. Hybrid F1 mice generated from 129/sv and C57BL/6J mice were used in the previous study by Choi et al. (2007), and the C57BL/6J background mice were used in the current study. To test this possibility, we performed acid-induced mechanical nociceptive response using 129/sv WT and Cav3.2−/− mice. Our results showed that 129/sv Cav3.2−/− mice displayed reduced mechanical nociceptive response in the first acid-induced mechanical hyperalgesia when compared to the WT mice. Similar to what we observed in C57BL/6J background, the second acid-induced chronic hyperalgesia was also abolished in the 129/sv Cav3.2−/− mice. These results demonstrate that regardless of the mouse genetic background difference, loss of Cav3.2 T-channels impairs the development of acid-induced chronic hyperalgesia. It has been reported that Cav3.1−/− mice display normal responses to acute thermal and mechanical stimuli and similar hyperalgesia responses to cutaneous pain induced by complete Freund's adjuvant when compared with WT mice (Kim et al., 2003). However, Cav3.1−/− mice display enhanced hyperalgesia to visceral pain and attenuated response to spinal nerve ligation (SNL)-induced neuropathic pain (Kim et al., 2003; Na et al., 2008). On the other hand, Cav3.2−/− mice show reduced nociceptive responses to acute thermal and mechanical stimuli. Inflammation pain induced by formalin was also attenuated in Cav3.2−/− mice (Choi et al., 2007). However, there is no significant difference between the WT and Cav3.2−/− mice in response to SNL-induced neuropathic pain (Choi et al., 2007). These studies using genetically modified animal models suggest that Cav3.1 but not Cav3.2 is involved in the central sensitization for SNL-induced neuropathic pain. Interestingly, Bourinet et al. (2005) show that knockdown of Cav3.2 but not Cav3.1 or Cav3.3 T-channel using antisense oligonucleotides via intrathecal injection reduces acute thermal and mechanical nociceptive responses and neuropathic pain induced by chronic constriction injury (CCI) of the sciatic nerve in rat (Bourinet et al., 2005). The reasons for the discrepancy on the role of T-type Ca2+ channel subtypes in the development of neuropathic pain are not clear. The discrepancy could be caused by different neuropathic pain models used (SNL vs CCI), or there is some unknown compensatory mechanism occurs in the gene knock out mice. In this study, we showed that the chronic mechanical hyperalgesia induced by repeated acid injections is maintained in WT and Cav3.1−/− mice but is absent in Cav3.2−/− mice. These results further demonstrate that Cav3.1 and Cav3.2 T-channels play differential roles in different pain models. Acid-induced chronic mechanical hyperalgesia is unrelated to tissue damage and is not maintained via a continued primary afferent input but rather via changes in the CNS (Sluka et al., 2001). Most of the reported changes observed in the CNS are at the spinal cord level during the development of the acid-induced chronic hyperalgesia (Sluka et al., 2001, 2002, 2003; Skyba et al., 2002; Hoeger-Bement and Sluka, 2003). However, Sluka's group has demonstrated that descending facilitatory pathways from the rostral ventromedial medulla (RVM) in the brain stem initiate and maintain the acid-induced chronic muscle hyperalgesia, and blockage of NMDA receptor in RVM could reverse this hypersensitivity (Tillu et al., 2008; Da Silva et al., 2010). Our results demonstrated that PVA is another brain region involved in the central sensitization in acid-induced chronic muscle hyperalgesia. It is unclear how the nociceptive signals transmitted from PVA to RVM and whether PVA is involved in the ascending or descending pathways. Further experiments will be needed to answer these questions. We showed that there is a time window of 10–15 min after the second acid injection for ETX to effectively block the acid-induced hyperalgesia (Fig. 3). These results suggest that T-channels are required for the initiation of the acid-induced chronic mechanical hyperalgesia. The reasons for this phenomenon are unknown. It is possible that repeated acid injections activate T-channels in brain, and the signaling pathways initiated by Ca2+ influxes via T-channels are required for the initiation of chronic hyperalgesia. Once the Ca2+-dependent signals were transmitted, the activation of T-channels was no longer required for the maintenance of chronic hyperalgesia, and thus a delay application of ETX is no longer effective. Our results here suggest that Cav3.2 T-channels may play an important role in the “primed state” (Hucho and Levine, 2007) during the development of acid-induced chronic hyperalgesia. To determine whether there is acid-induced and T-channel-dependent neuronal activity after repeated acid injections in brain, we measured the activation of ERK by detecting pERK immunoactivity in brain. ERK is one of the signaling pathways involved in neuronal plasticity and can be activated by membrane depolarization and calcium influx (Otake et al., 1994). Activation of ERK in the spinal dorsal horn neurons is required for central sensitization during the development of hyperalgesia and allodynia in nerve injury- and inflammation-induced neuropathic pain model (Ji et al., 1999; Bhave et al., 2001). Supraspinally, it has been reported that ERK is activated in the CeA and anterior cingular cortex (ACC) after peripheral injury (Carrasquillo and Gereau, 2007; Wei and Zhuo, 2008). Carrasquillo and Gereau (2007) further demonstrate that blocking of ERK activation in amygdala prevents the mechanical hyperalgesia induced by formalin. In our study, the only brain region that displayed acid-induced and Cav3.2-dependent positive pERK staining is PVA. Retrograde tracing studies in rat (Peschanski and Besson, 1984; Chen and Su, 1990; Otake et al., 1995; Novak et al., 2000; Krout et al., 2002) show that PVA receives projections from regions that are important in generating pain perception such as ACC, CeA, parabrachial area (PB), PAG, dorsal and medial raphe nucleus, and nucleus raphe magnus (Price, 2000; Millan, 2002). Although PVA is not commonly known as the pain matrix in the brain, increased c-Fos expression and pERK staining in PVA have been reported in several pain models in rat and mouse (Bullitt, 1990; Davies et al., 1997; Gioia et al., 2001; Chung et al., 2007; Nishii et al., 2008; Zhang et al., 2009). In the present study, pharmacological inactivation of ERK in PVA blocked the acid-induced chronic hyperalgesia in WT mice. Together, these data support the idea that PVA is involved in the central sensitization related to nociceptive hypersensitivity. We also found that acid-induced ERK activation in the PVA requires Cav3.2 T-channels. An in situ hybridization study indicated that Cav3.2 transcripts are also present in the mouse PVA region (Allen Brain Atlas, http://www.brain-map.org), and Zhang et al. (2006) has shown that most PVA neurons display T-type Ca2+ currents in brain slice preparations. Therefore, it is likely that Cav3.2 T-channels in PVA are required for the ERK activation and chronic mechanical hyperalgesia induced by acid injection. 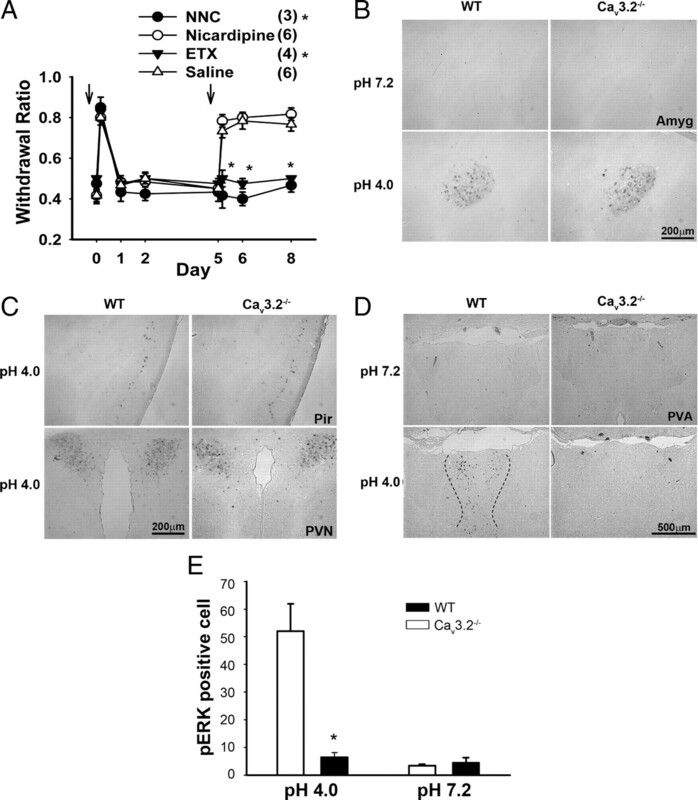 Furthermore, pharmacological activation of ERK in Cav3.2−/− PVA restores the chronic hyperalgesia, indicating that activation of ERK is a downstream signaling pathway of Cav3.2 T-channels that is important in acid-induced chronic hyperalgesia. It is unclear how the acid-induced signals reach PVA. One possibility is that the acid-induced signals transmit via CeA to PVA. CeA is known to be involved in the ascending nociceptive pathways and receives the nociceptive signals either indirectly via lateral amygdala from spinothalamic pathway or directly from PB through spino-parabrachio-amygdaloid pathway (Bernard et al., 1989; Neugebauer et al., 2004). Enhanced pain-related PB-CeA synaptic potentiation is observed in arthritis and neuropathic pain models (Neugebauer et al., 2003; Ikeda et al., 2007). It has been suggested that formalin-induced ERK activation in CeA is transmitted through spino-parabrachio-amygdaloid pathway (Carrasquillo and Gereau, 2007). Retrograde labeling studies in rat shows that PVA neurons could receive projections from CeA (Otake et al., 1995; Novak et al., 2000). We detected increased pERK signals in amygdala in both WT and Cav3.2−/− mice after repeated acid injections, while in PVA pERK staining was only observed in the WT animals. Furthermore, PVA infusion of U0126 abolished the pERK staining in PVA without affecting the amygdala pERK staining in WT animals. Therefore, these data suggests that acid-induced nociceptive signals probably reach amygdala through spino-parabrachio-amygdaloid pathways and then project to PVA. We conclude that brain Cav3.2 T-channels are required for the development of chronic mechanical hyperalgesia induced by repeated acid injections. Loss of Cav3.2 T-channels abolished the chronic hyperalgesia induced by the second acid injection while leaving the first acid-induced hyperalgesia intact. These data suggest that Cav3.2 T-channels are involved in the central sensitization of acid-induced chronic mechanical hyperalgesia. Our data provide clinical relevance in that regulation of Cav3.2 T-channels may be a potential approach to intervene in chronic muscle hyperalgesia. Our work is supported by grants from the Academia Sinica (AS95IBMS6) and the National Science Council (NSC), Taiwan (NSC-95-2320-B-001-030, NSC-95−2320-B-001-036, NSC-96-2311-B-001-041-MY2) to C.-C.C. We thank the Taiwan Mouse Clinic (NSC 97-3112-B-001-025), which is funded by the National Research Program for Genomic Medicine at the NSC of Taiwan, for technical support. We thank Kevin P. Campbell for critical reading of the manuscript. (1989) A possible spino (trigemino)-ponto-amygdaloid pathway for pain. Neurosci Lett 100:83–88. (2001) Peripheral group I metabotropic glutamate receptors modulate nociception in mice. Nat Neurosci 4:417–423. (1990) Expression of c-fos-like protein as a marker for neuronal activity following noxious stimulation in the rat. J Comp Neurol 296:517–530. (2003) Abnormal coronary function in mice deficient in alpha1H T-type Ca2+ channels. Science 302:1416–1418. (1990) Afferent connections of the thalamic paraventricular and parataenial nuclei in the rat–a retrograde tracing study with iontophoretic application of Fluoro-Gold. Brain Res 522:1–6. (2007) Effects of intrathecal injection of T-type calcium channel blockers in the rat formalin test. Behav Pharmacol 18:1–8. (2009) The Ca(v)3.2 T-type Ca(2+) channel is required for pressure overload-induced cardiac hypertrophy in mice. Circ Res 104:522–530. (2007) Attenuated pain responses in mice lacking Ca(V)3.2 T-type channels. Genes Brain Behav 6:425–431. (2007) Neonatal maternal separation enhances central sensitivity to noxious colorectal distention in rat. Brain Res 1153:68–77. (2003) Chronic widespread pain and fibromyalgia: what we know, and what we need to know. Best Pract Res Clin Rheumatol 17:685–701. (2010) Activation of NMDA receptors in the brainstem, rostral ventromedial medulla, and nucleus reticularis gigantocellularis mediates mechanical hyperalgesia produced by repeated intramuscular injections of acidic saline in rats. J Pain 11:378–387. (1997) Long-term antianginal and antiischemic effects of mibefradil, the novel T-type calcium channel blocker: a multicenter, double-blind, placebo-controlled, randomized comparison with sustained-release diltiazem. Am Heart J 134:220–228. (2008) Central mechanisms in the maintenance of chronic widespread noninflammatory muscle pain. Curr Pain Headache Rep 12:338–343. (2004) Neurotrophin-3 reverses chronic mechanical hyperalgesia induced by intramuscular acid injection. J Neurosci 24:9405–9413. (2001) Extracellular signal-regulated kinases 1 and 2 phosphorylated neurons in the tele- and diencephalon of rat after visceral pain stimulation: an immunocytochemical study. Neurosci Lett 308:177–180. (2003) Phosphorylation of CREB and mechanical hyperalgesia is reversed by blockade of the cAMP pathway in a time-dependent manner after repeated intramuscular acid injections. J Neurosci 23:5437–5445. (2004) NNC 55-0396 [(1S,2S)-2-(2-(N-[(3-benzimidazol-2-yl)propyl]-N-methylamino)ethyl)-6-fluo ro-1,2,3,4-tetrahydro-1-isopropyl-2-naphtyl cyclopropanecarboxylate dihydrochloride]: a new selective inhibitor of T-type calcium channels. J Pharmacol Exp Ther 309:193–199. (2007) Signaling pathways in sensitization: toward a nociceptor cell biology. Neuron 55:365–376. (2006) The role of peripheral T-type calcium channels in pain transmission. Cell Calcium 40:197–203. (2002) Brainstem projections to midline and intralaminar thalamic nuclei of the rat. J Comp Neurol 448:53–101. (1995) c-fos expression in the paraventricular nucleus of the hypothalamus following intracerebroventricular infusions of neuropeptide Y. Brain Res 670:59–65. (2008) Attenuated neuropathic pain in Cav3.1 null mice. Mol Cells 25:242–246. (2003) Synaptic plasticity in the amygdala in a model of arthritic pain: differential roles of metabotropic glutamate receptors 1 and 5. J Neurosci 23:52–63. (2008) Thalamic neural activation in the cyclophosphamide-induced visceral pain model in mice. Neurosci Res 60:219–227. (2000) Suprachiasmatic nucleus projections to the paraventricular thalamic nucleus in nocturnal rats (Rattus norvegicus) and diurnal nile grass rats (Arviacanthis niloticus) Brain Res 874:147–157. (1994) Afferents to the midline thalamus issue collaterals to the nucleus tractus solitarii: an anatomical basis for thalamic and visceral reflex integration. J Neurosci 14:5694–5707. (1995) Adrenergic innervation of forebrain neurons that project to the paraventricular thalamic nucleus in the rat. Brain Res 697:17–26. (1975) Pharmacokinetic properties of ethosuximide in monkeys. I. Single-dose intravenous and oral administration. Epilepsia 16:705–716. (2006) Molecular characterization of T-type calcium channels. Cell Calcium 40:89–96. (1984) Diencephalic connections of the raphe nuclei of the rat brainstem: an anatomical study with reference to the somatosensory system. J Comp Neurol 224:509–534. (2000) Psychological and neural mechanisms of the affective dimension of pain. Science 288:1769–1772. (2001) The DRASIC cation channel contributes to the detection of cutaneous touch and acid stimuli in mice. Neuron 32:1071–1083. (2002) Effects of NMDA and non-NMDA ionotropic glutamate receptor antagonists on the development and maintenance of hyperalgesia induced by repeated intramuscular injection of acidic saline. Pain 98:69–78. (2001) Unilateral intramuscular injections of acidic saline produce a bilateral, long-lasting hyperalgesia. Muscle Nerve 24:37–46. (2002) Chronic muscle pain induced by repeated acid injection is reversed by spinally administered mu- and delta-, but not kappa-, opioid receptor agonists. J Pharmacol Exp Ther 302:1146–1150. (2003) Chronic hyperalgesia induced by repeated acid injections in muscle is abolished by the loss of ASIC3, but not ASIC1. Pain 106:229–239. (2008) Descending facilitatory pathways from the RVM initiate and maintain bilateral hyperalgesia after muscle insult. Pain 136:331–339. (2006) The role of T-type calcium channels in peripheral and central pain processing. CNS Neurol Disord Drug Targets 5:639–653. (2006) Mechanisms underlying development of spatially distributed chronic pain (fibromyalgia) Pain 124:242–263. (2008) Activation of Erk in the anterior cingulate cortex during the induction and expression of chronic pain. Mol Pain 4:28. (2009) Role of voltage-gated calcium channels in ascending pain pathways. Brain Res Rev 60:84–89. (2006) Suprachiasmatic nucleus communicates with anterior thalamic paraventricular nucleus neurons via rapid glutamatergic and gabaergic neurotransmission: state-dependent response patterns observed in vitro. Neuroscience 141:2059–2066. (2009) Activation of extracellular signal-regulated protein kinase is associated with colorectal distension-induced spinal and supraspinal neuronal response and neonatal maternal separation-induced visceral hyperalgesia in rats. J Mol Neurosci 37:274–287.